The Grand Finale Table-Flipping Contest! FOOD + BOARD GAMES = AWESOME! Our friends at Bezier Games are helping us host a Pizza Party! We'll be chowing down on pizza WHILE playing with it! The buffet will include a drink, and oh yeah, Bezier's going to make sure that all attendees at this event go home with their own copy of the New York Slice. 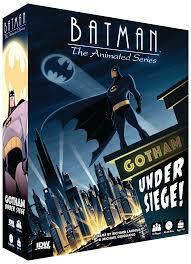 To help celebrate the recent release of Batman: The Animated Series - Gotham Under Siege, designed by one of our VIP guests Richard Launius, we're holding a Batman-themed dinner party and you're invited! Come hobnob with all of our VIPs and special guests and enjoy a fine Carolina BBQ buffet. Attendees will walk away with a special token of our appreciation. The magnificent folks at Bellwether Games will be helping us host a Mars Open Tournament. Winners will walk away with a copy of the game! For a fast and furious lunch, our spectacular sponsors at Gamewalker will be hosting an event featuring the card game Nertz! Grab some grub while grabbing your cards and having a great time with friends. Winners from each table will play a championship game against Jacob and Kassie from Gamewalker. The top three teams will receive $100, $75,and $50, respectively, in Tantrum Bucks that can be spent at any of our vendors at TantrumCon!